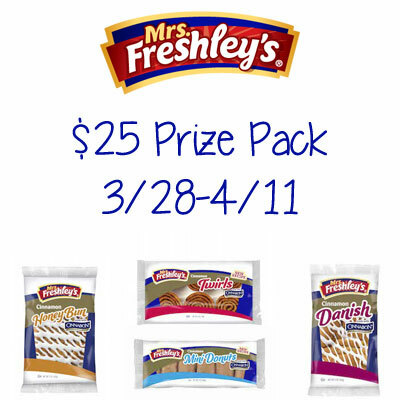 Take a look and you’ll see Mrs. Freshley’s bakes a huge variety of products that are sure to tempt any sweet tooth. Not only are they a hit with consumers, but with industry award judges too. Numerous quality and taste awards have been bestowed upon Mrs. Freshley’s over the years, including those from American Culinary Institute, Automatic Merchandiser and CSP Magazine , just to name a few. Thank you so much for including my readers here at Tales From A Southern Mom. These look fabulous! I love when I can win food and try new things! I love their cheese danishes! Their powdered mini donuts are my favorite! I like their Swiss Rolls Creme Filled Cakes. The Cinnamon Twirls are awesome! The cinnamon Danish is yummy!! It would have to be the chocolate cupcakes but, I have not tried this product brand before. I have never tried Mrs. Freshley’s.